This text draws together a set of characteristics that can be used as building blocks for a conceptual model of Affect Space. I have previously described Affect Space as an emerging techno-sensuous spatial order. Here I build upon these earlier investigations and the outcomes of the Technology / Affect / Space (T / A / S) public research trajectory conducted in 2016, which included public seminars in Amsterdam, Cambridge, MA and Rotterdam. The investigations continue in a series of commissioned essays on Open!, of which this text is one. These essays can help to articulate new design strategies for this quickly evolving context, where the spatial design disciplines are curiously absent from the debate. The so-called ‘movement(s) of the squares’1 did not precisely invent a new dynamic of mobilization of crowds and activation of public space – it rather revealed an emerging spatial order enabled by distributed electronic communication networks and the proliferation of wireless, mobile media inextremely ‘densified’ urban spaces. This emerging spatial order produced paradoxical spectacles that seemed at once strangely familiar and curiously novel, massive as well as evanescent. 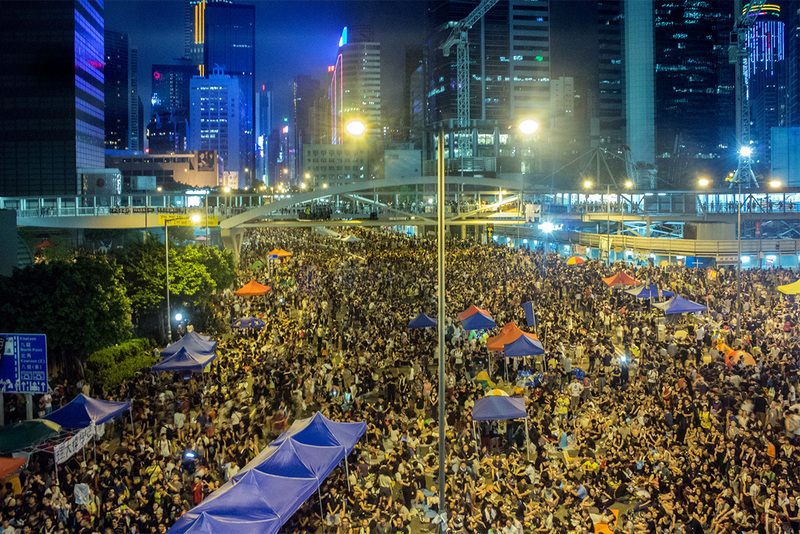 Since 2011 we all (as a global predominantly online media audience) have witnessed recurrent spectacles of massive dissenting gatherings in public space. They originate in networked exchanges, then spill over into the streets and squares, effortlessly switching between geographic, cultural and sociopolitical contexts. We witnessed the action not via mainstream mass-media channels, but almost in real-time, live-streamed on social media feeds, blogs and activist sites, to our buzzing smartphones. While revolving around a variety of heterogeneous issues / things, these gatherings remained remarkably constant in their patterns of mobilization / activation: in addition to online mobilization being followed by embodied gatherings in public space, the spaces became connective platforms in which to create synchronous and asynchronous feedback with electronic networks. This action in physical space drew even more subjects into an ‘attractive field’, iteratively generating further feedback between networked and embodied presences that dissolve and fade out as easily as they expand exponentially. Beyond the non-linear and highly unpredictable dynamics at work here, these events seemed particularly impenetrable when the pattern started to replicate itself in self-similar manifestations where any substantive political, ideological or material issue / thing was explicitly absent.2 No longer was the issue the ‘thing that brings us together because it divides us most’,3 but in the absence of an issue the gatherings seemed almost ‘blind’, autonomous, self-organizing, pertaining only to some inscrutable internal logic as yet to be unveiled. And crucially: void of any particular content. Thus leaving the question of how to account for them wide open. Technological: Namely, the Internet. In particular, pointing to the massive use of mobile and wireless media that perform a crucial function in mobilizing large groups of people around ever changing ‘issues at stake’. Affective: The affective intensity generated and exchanged in these processes of activation and mobilization is instantiated in the body of the physical actors in the streets and squares. It indicates an insistent ‘somatic turn’ away from the symbolic towards a physically registered, felt intensity that resonates with other bodies and objects. Spatial: Affective intensities generated in the activation process cannot be shared effectively in disembodied online interactions. This lack stimulates the desire for physical encounter, which can only happen in a physical spatial context, paradigmatically in (urban) public space. This text expands on the above model. While some aspects of this conceptual model may seem speculative, the emerging techno-sensuous spatial order of Affect Space is already underway: in new forms of public assembly with often contradictory dynamics: in new forms of distributed policing and control in and of public space; and as part of a highly evolved system of technologically enabled ‘persuasion design’,4 deeply embedded in the structure of corporate technology giants. The object of this model is not purely speculative, even if it speculates about the general characteristics and traits of an emerging order that hold important cultural and political implications. 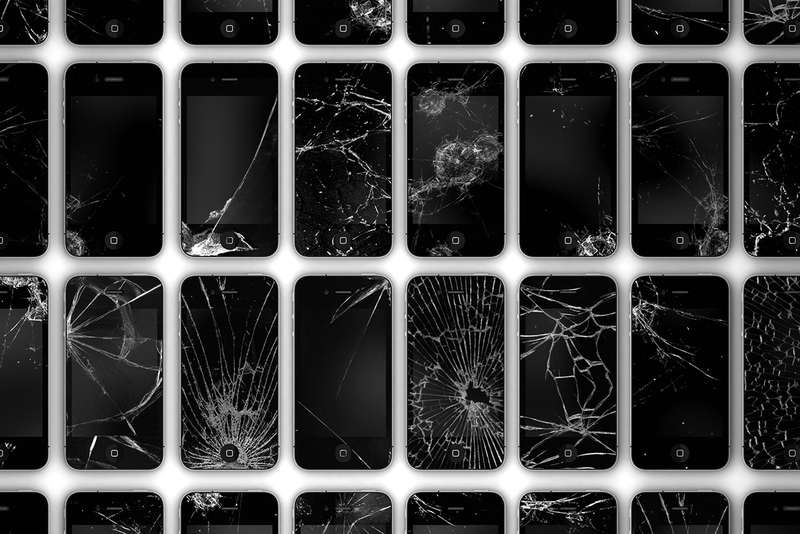 The emerging order of Affect Space conflates the functions of the most advanced media systems, the activation of public spaces and the individual subjective experiences engendered by their mingling – what Félix Guattari referred to as the subjective ‘universes of reference’.5 These different ‘registers’ are of crucial importance to the functioning of contemporary democracies, and need to be considered carefully in relation to each other. Affect Space is intensely synaesthetic. It involves all the senses, all of the sensuous registers, in incongruous concert. Sensation(s) in Affect Space is (are) not unified. This is an important part of their activating potential. There is little argument needed to maintain that seeing an event unfold in public space via a screen (at home, in the work place, in transit on a mobile media device, through a live-stream or social media feed) is remarkably different from actually being part of that event physically in public space (in a park, on a square, a street). Both types of experience may be charged with intensity, but the mediated experience is necessarily characterized by delimitation, a lack of physical cues or proximity, an absence of participation in full. The more dramatic the witnessed action, the more anaemic the mediated experience feels. It is this tension between a charged event witnessed from afar and its intensity unfolding in the immediacy of embodied space that fuels the desire for physical encounter. Still, the mediated experience in itself is also entirely synaesthetic, but here the felt tension is between what is witnessed / mediated on the screen and in sound from afar, and the body embedded in a strictly local environment, cued to that locality rather than the mediated action. This tension necessarily remains unresolved. The felt dissonance between these two simultaneous and interlacing experiences charges the witnessing subject with a potential as yet undirected energy. Affect Space builds on and extends the concept of Hybrid Space. First proposed by architects Frans Vogelaar and Elizabeth Sikiaridi,6 Hybrid Space designates a single unified concept of space that is characterized by the simultaneous presence (co-presence) of different, heterogeneous, and at times contradictory (operational) spatial logics. The concept proceeds from the assumption that different spatial logics are superimposed in any ‘lived’ space. Physical structures, whether natural or constructed, are superimposed with processual flows that operate according to a different and mostly incommensurable spatial logic. Such flows can be flows of communication, trade, goods and service provision, transportation, data flows and even face-to-face exchanges and public gatherings of different kinds. While the concept of Hybrid Space is thus not necessarily defined by the superimposition of technological infrastructures onto the ‘natural’ or built environment, the density and heterogeneity of space is greatly increased by electronic communication media, especially by the increasing presence of electronic signals, carrier waves and wireless communication and data networks in lived environments. The knotting of dense webs of interhuman relations identified by Flusser, is intensified exponentially by the proliferation of networked and mobile wireless media. Adrian Mackenzie, for instance, in his book Wirelessness, speaks of ‘overflows’ (spatial, thing, body, private-public) redrawing boundaries and reorganizing spaces of action.8 Crucially, though, Flusser recognizes these dense webs of interhuman relationships as constituting the concrete lifeworld of contemporary urban subjects, implying that both urban space and subjective experience are transformed simultaneously by these ‘densifications’. This constellation should be regarded as inherently unstable. The density of Hybrid Space varies not only from place to place, but also from moment to moment. Carrier signals appear and disappear, sometimes because of an economic boom or collapse, sometimes because of government intervention (regulation), sometimes because of purely physical interference (overlapping signals can cause network failure). Connection speeds and capacities vary continuously. Thus the ‘knotted webs of interhuman relationships’ continuously tighten and loosen. When networked linkages become increasingly tight, interhuman relationships tend to shift from a deliberative to an affective level. Information overload, viral visual, auditory and textual messages, continuous demands for responses, haptic feedback mechanisms (buzzing phones, thumbing wearables) induce this shift from deliberation to the play of affective registers. When observing from a distance, on screen, the ever tighter linkages between the physical domain and electronic networks intensify the felt dissonance between mediated and embodied experience enormously. The ‘screen’ can stir but not fulfil these elicited physical desires. As observed earlier, the lack of an immediate embodied relation drives the quotidian media subject ‘beyond the screen’ into the streets and squares to find an unmediated connection. The resulting proximity of bodies, masses of bodies, in urban public space, cued to an as yet unarticulated intensity, galvanizes the flow of affect, further intensifying the webs of interhuman relations. What we have witnessed in these large gatherings since 2011 (and prototypical before) is the passing of an affective threshold. Mobile wireless media perform a crucial function in this ensuring the unmediated action / connection is immediately fed back into the integrated network, synchronous and asynchronously via uploads in higher bandwidth zones drawing in ‘more interhuman relations from the periphery’. The conditions for passing the affective threshold are strongest where the knotted webs are most dense / tight. Typically we find these ‘dense webs’ in large urban concentration zones where a diversity of (communication) technologies and people overlap. The conditions that enable the passing of the affective threshold turn public space into a ‘performance space’. To some extent public space has always been ‘performative’. Now massified practices of self-mediation, particularly advanced by smartphones, play a crucial role in this. ‘Self-mediation’ refers to the constitution of mediated presence by non-professional media producers. Social and cultural theory researcher Lilie Chouliaraki has observed that self-mediation is characterized by a ‘performative publicness’.9 What the mobile media enable is a self-enactment simultaneously in public space and in the media network, especially when live-stream is involved, in near real-time. I have previously referred to this double self-enactment as the constitution of a double presence in Hybrid Space.10 The primary aim of self-mediation is not to communicate information but to establish affective relationships. Self-mediation shifts the emphasis from being directed at specific content to the processual in mediated expressions. Affect Space is hence both performative and processual. It would be a mistake to argue that Affect Space has no content at all, however. On the contrary, it is filled with potential and differential content that can manifest itself at any time and in any place, often quite unexpectedly. The activation of Affect Space does not happen primarily around issues, but around performative presences that can produce strong affective intensities. It is necessary to understand these ‘performative presences’ more precisely. They can manifest themselves in public space on any scale in and through the bodies of multiplied singular actors (the protestor(s) in the case of the ‘movement(s) of the squares’). They can also manifest independent of this particular actor’s physical body. In this case images, sounds, objects, symbols, textual messages, videos, collective chants act as resonance objects that carry not a particular or specific meaning, but rather a limitless potential for producing meaning / sensation / intensity. I call these resonance objects ‘Affective Attractors’: instantiations of ‘potential[s] for interaction’,11 varied in strength and that can appear across the full range of sensory stimuli and any mediating structure. Different types of affective attractors operate in their own specific ways as resonance objects. Their strength depends on whether they produce a strong or weak resonance with the affective state of the participant in the action / event. The classic iconographic protest image is the protest sign, usually held before a protestor’s chest. This image, immortalized by Bob Dylan and D. E. Penebaker’s 1965 music video avant la lettre ‘Subterranean Homesick Blues’,12 derives its power from its lack of sophistication. The ‘amateurish’ signs appear improvised, made out of cheap materials with badly drawn letters. What Jean Baudrillard so beautifully described as ‘the uncanny charm of the simulacrum’s authenticity-effect’,13 inscribes itself in the ragged edges of the cardboard signs and the messy lettering. The eternal repetition of this visual cliche reveals its ‘true’ nature as a mediatized self-replicating meme. Not an expression of an ‘authentic’ desire, but a pure sign, operating in the mode of simulation, a copy without original, a simulacrum, and as Baudrillard states at the outset of his famous ‘Precession of Simulacra’ essay; ‘the simulacrum is true’, paraphrasing Ecclesiastes. The affective charge of the sign derives here not so much from its actual content, usually generic phrases, but from its instant recognition as a protest sign. There is, however, a ‘second order’ of visual attractors that projects a much more powerful incipient connective force. This visual sign depends on a rupture of the semantic field, identified most precisely by Roland Barthes in his brilliant Camera Lucida as the ‘punctum’.14 In ‘Affect Space’ I analyse this mechanism in relation to the iconic Lady in Red image that became an immensely powerful affective attractor during the Gezi Park protests in Turkey in 2013. There the visual sign relies not on the instant recognition of a visual cliche become vernacular, but on producing a visual incongruity that disrupts interpretation opening up an interpretative and experiential void. Confronting this void, impossible to interpret breaches an infinite space of potential in which affect can flow freely. The connective force of these second order visual attractors derives from this impossibility of interpretation. They are then free to ‘connect that which is usually indexed as separate’.15 Visual attractors, such as the Lady in Red, can become particularly powerful affective resonance objects. Brian Massumi suggests that affect, a non-conscious and never to be conscious bodily intensity, does not oppose language. Language has a differential relation to affect expressed as resonance. This resonance can be strong or weak, in the first case tremendously amplifying a felt, but as yet not (fully) articulated intensity, and in the second dampening that felt intensity. Consciously articulating felt intensity captures and gives closure to affect. Massumi states that ‘emotion’ (as a conscious state) is the most intense / contracted expression of that capture.16 In other words language / articulation that designates itself a particular conscious state (emotion) or a definite concept (deliberation) will typically dampen affect. Conversely, language that is most void of semantic content can serve to amplify affect, particularly when its purely syntactical and rhythmical structure enhances the free play of cognitive faculties without a designated particular concept. The ‘semantically open’ structure of such language resonates strongly with the semantic openness of affect, exactly because of the absence of particular content that would inhibit the free flow of affect / intensity. Aphoristic slogans, chants, short sentences create a vague but insistent sense of connection and turn out to be particularly powerful affective attractors (‘We are the 99%’ / ‘Je suis Charlie’), precisely because of their absence of particular content. Again, it would be a misconception (Massumi would gracefully say a ‘missed conception’)17 to derive from this that affect has no content. On the contrary affect has an overabundance of potential content, a ‘too much’ that forces its way to some expression / manifestation, building up as long as it escapes capture. This potential predicts future events without knowing where / when they will arrive because it can still connect that which is usually indexed and treated as separate (including diametrically opposed political positions). This is what determines its inherent unpredictability. The human mike procedure used to amplify a single speaker to a crowd of any size without electrical amplification – practised in countless protest gatherings and immortalized in the #occupy gatherings on Wall Street and elsewhere in the United States and beyond – is a prime example of an auditory affective attractor. The procedure requires a speaker to speak in preferably short phrases, which are then repeated by the crowd (chorus) collectively. The triple ‘mike check’ is performed before each speech to temporarily synchronise the voices in the crowd. Experience has shown that short and rhythmically well-constructed phrases work best in this type of setting, while the content of speeches filled with elaborate argumentation tends to dissipate. The true affective power of this auditory attractor lies not in the phrase itself (its syntactical or rhythmic construction), and certainly not in its content (semantics), but in the process of collective reproduction of the original phrase. The human mike is particularly inapt at initiating a process of deep and sophisticated (subtle) deliberation, yet it also creates an enormously powerful sense of connectedness across the crowd / chorus of participants. This connection is established not through what is specifically said (content / semantics), but in the collective speech act (the active participation in the collective action / event). In this sense the conventions of the human mike seem close in character to religious chanting, in which what is uttered is already known, focusing attention almost entirely on the collective process and its implied ritual meanings. one’s own pre-existing state of affectedness (a state existing in advance of entering the crowd). When asked in a 2016 interview what comes before affect, Massumi replied ‘participation’.18 The participation in the crowd can in itself lead to a state of being affected by the intensities contained in others’ bodies, irrespective of one’s affective state before participation in the event: smell, hormonal exchange, body temperature, moist-level, gesticulation, facial expression, bodily posture and movement, murmur, conversation, cheering of the crowd / chorus – they all facilitate the capacity of affecting and being affected. Through this recognised vitality of the body, the particular body starts to act as a corporeal resonance object, a corporeal attractor that galvanises the flow and amplification of affect in the crowd. Also here, an increased density (proximity and scale) of bodies (in a crowd) can facilitate the passing of the affective threshold and enable an exponential amplification of intensity / affect. The erroneous conclusion too often drawn from this is that affect has no content. As observed earlier, we should rather regard affect as overfull with potential content and action. Massumi states: ‘the half second lapse between the beginning of a bodily event and its completion in an outward directed, active expression – this half second is overfull – in excess of its actually performed action and ascribed meaning. Will and consciousness are subtractive – limitative, derived functions that reduce complexity too rich to be functionally expressed.’21 In the process of mobilization of crowds and activation of public spaces this holds a crucial implication: under conditions where passing the affective threshold precipitates the primacy of affect over deliberation / conscious articulation, what acts as the connective tissue bringing together masses of previously unrelated actors is not so much a shared issue, but rather a shared affective resonance. The passing of the affective threshold induced by the intense densification of Hybrid Space dislocates traditional conceptions of social action and social movements. Shared ‘collective action resources’ are no longer the primary source of activation of public space and large scale social / political formations. The shift from collective action to connective action proposed by Lance Bennett and Alexandra Segerberg also does not fully capture this new condition.22 Bennett and Segerberg argue that the communication structures take the place of traditional organizational structures (unions, political parties, NGOs, action committees) and the ‘collective action resources’ that social movement theory attributes to these strategic actors. The communication structures themselves become the organizational structure, they argue, mobilized by connective action around a shared sociopolitical issue. What their view fails to take into account, however, is the primacy of the connective force of affect under conditions of intense densification and its inherent semantic openness. The shared affect under such conditions can accommodate a theoretically unlimited range of personal and / or collective issues, while the strength of its connective force is strongest when a designation to any particular issue remains absent, or is only vaguely indicated (‘We are the 99%!’). It is then in this view the ‘Issue’ (Marres), or ‘Thing’ (Latour) that brings a public into being. In her analysis Marres defers to the Lippmann-Dewey debate of the 1920s to discuss the wider displacement of politics outside of conventional democratic arrangements, particular transnational institutions and global networks of Non-Governmental Organizations, where singular issues become the activating units for engendering a constantly moving political formation – or, in Latour’s terms, ever shifting modes of assembly. The title of Marres’ PHD thesis makes the centrality of this mechanism immediately clear: ‘No Issue, No Public’. In events operating under the primacy of affect then, there is no immediate relation to a singular connective issue, but a differential relation to a multitude of possible, potential, implicit and explicit issues. The connective force of this type of affective gathering dissipates when the issues / things at stake become singular. We should raise the question here if it is still legitimate to call these social formations ‘publics’. And if there is no public, only differential affective ties, what does this mean for the democratic arrangements already displaced by issue / thing politics? The temporality of the primacy of affect under conditions of intensive densification needs to be examined a bit further. The missing half second that Massumi has identified marks a field of absence, a space of disappearance, where consciousness is absent, disappeared in a duration too short to be accessed by cognition. The speed of affect creates a temporality of events registered by the body (as felt intensity), where consciousness not so much has difficulty of keeping up, but physically cannot operate because of the extended duration required for cognitive processing. This intensive temporality of Massumi’s missing half-second bears more than a passing resemblance to the aesthetics of disappearance described by the French architect and theorist Paul Virilio. The connection may be not entirely surprising, given that Massumi has translated and edited several seminal works of Virilio in English. In The Vision Machine (1988), Virilio observes that under pressure of continued strategic acceleration, time itself becomes the object of technological research and development.28 Processes formerly handled by human operators are accelerated to a point where human consciousness and cognition no longer gain access because of their pure speed. This ‘fatal strategy’ is most clearly recognizable in military conduct, where increased speed constitutes a strategic advantage over the adversary, or at least the prevention of a strategic disadvantage. The same trend can also be observed in the civil domain, for instance, in automated screen trading, which has intensified exponentially both in speed and volume (the one being an expression of the other) since Virilio wrote his acid critique of these systems. This trend towards technological acceleration / intensification beyond the human limit of access, leads to a split into two disparate time forms. Virilio calls human time, of conscious perception and articulation, ‘Extensive Time’, where past, present and future are still available to consciousness. Its threshold is the time it takes for a visual impression to be fixed by the retina, for impulses to travel and be processed by the visual cortex, and for auditory signals to be registered by the ear and neurologically filtered. Any process beneath this critical threshold, too short in duration to be consciously registered and processed, simply disappears from conscious perception. Such processes and events accelerated to an ever-shrinking ultrashort duration below the threshold of conscious perception give rise to a new technologically constructed time-form. Virilio calls this new time-form ‘Intensive Time’. Here we see the true meaning of the word simulation for which he argues: simulation does not aim to represent anything, instead it substitutes that which it simulates – in this case human perception. And these artificial perception systems (perceptrons) do so under a strategic operative where the continuous drive for acceleration is guided by strategic (military / economic) necessity. As humans we no longer have access to these processes. We can only imagine their operations, similar to how we can imagine the inaccessible electrochemical exchanges in our brains that precede cognition. These accelerated processes disappear into the time / space of ultrashort duration. They only become apparent and intelligible to us when there is a breakdown, an accident, a catastrophe, at which point they become visible to us as the fall-out of a fatal strategy gone wrong. Virilio’s image also suggests the active presence of a multitude and ever growing number of non-human agents in public spaces. Network nodes, signal transmitters, routers, software agents, portable media clients and their continuously active communication protocols, surveillance systems, smart objects, location aware devices, automated traffic control systems and many other systems that ‘operate’ public spaces. Performing their actions in the ultrashort duration of Intensive Time they remain invisible to us ‘mere’ humans, disappearing from perception into the new technologically constructed time-forms. Affect and the new technological processes thus share the Intensive Time form of the ultrashort duration. As mentioned before Affect Space is not a speculative object. This becomes most clear when examining the emergence of an ‘affective control space’ in which new forms of affective policing are deployed. The important shift in emphasis is that such new control regimes not only take indicators of physical events and real-time biometric data collection (such as facial recognition systems) into account, but also indicators for mood changes, particularly in crowded urban areas (shopping and leisure districts and large scale public manifestations). Such indicators can be sudden behavioural changes, changes in the volume of sound-production in public space, as well as sentiment indicators in social media traffic and content. A good example of this new ‘affective’ approach to policing is the CityPulse pilot project, begun in 2015 by the City of Eindhoven in co-operation with digital services company Atos and the Dutch Institute for Technology Safety and Security (DITTS). The CityPulse pilot is focused on Stratumseind, a popular drinking area in the city, regularly welcoming up to 20,000 visitors on a given weekend, on which there will typically be a large number of public order disturbances. CityPulse intends to deploy police capacities more effectively to deal with these, reacting earlier based on a set of indicators that predict sudden ‘mood-changes’. As project-leads Paul Moore and Albert Seubers explain in a short article for the Atos / Ascent Magazine,29 CityPulse uses five key methodologies to analyse data from the streets in near real-time: social listening, real-time alerts, sentiment analysis, sound monitoring and movement tracking. To generate street behaviour and mood data, an elaborate system of sensors, trackers, and automated and integrated video surveillance analysis is deployed using multiple cameras (aiming to eliminate blind spots), and constant, real-time analysis of mood-shift indicators pertaining to traffic intensity (monitoring mobile media use) and area-specific social media activity. The data sets are crosslinked to insure reliability. In a sense this ‘predictive policing’ strives to generate increasingly reliable behavioural (affective) profiles of behaviour in public space to detect anomalies as early as possible and alert police before disturbances occur. Affective profiling and behavioural codification through automated surveillance systems become key instruments of affective policing. The final distinction I want to introduce is the objective versus subjective character of Affect Space. There is an obvious tension between the subjective experience of a felt bodily intensity described by Massumi and others as affect, and its objectification in measurable physical units and flows. It makes little difference whether this happens in the cognitive psychologists’ and neuroscientists’ laboratories, or in datafied surveilled urban spaces. The tendency here is towards a quasi-objectification of subjective experience by registering bodily cues (galvanic skin resistance, heart-rate, breathing patterns, respiration, blood pressure) and behavioural indicators. Increasingly, sensor technologies are built into wearable apparatuses (fitness trackers, smart watches, et cetera) that detect these cues continuously in a fully automated process with dedicated software and online platforms on which data are registered over time. Behavioural patterns can be distilled from this information, with lifestyle suggestions tailored to the user. The visualizations and explanation of technological methods for data capture suggest a quasi-scientific view of an affectively highly charged event, where the cumulative physical indicators (movement, network traffic, participants) suggest that the affective charge can be captured by ‘objective’ methods. There is an obvious gap between the anaemic visualizations and the intensity of the embodied events. Although the visualizations were meant to contest media and police focus on violence in protests, challenging the dominant narrative of ‘power structures’ that discredit protests, they instead seem to pacify the affective intensity. Yet in less intense and entirely non-violent situations the gap between subjective experience and objective capture of affective intensity persists. Artist / researcher Christian Nold realized this predicament in his early and highly original and innovative project series in bioand emotion mapping, and ‘emotional cartography’. He too used quasi-objective data visualization, linking affective markers to time-based cartographic explorations. He gradually realized he needed a different visual language to ‘map’ different perspectives of the situations he investigated: that is, data-driven perspectives alongside subjective participant accounts of terrains. 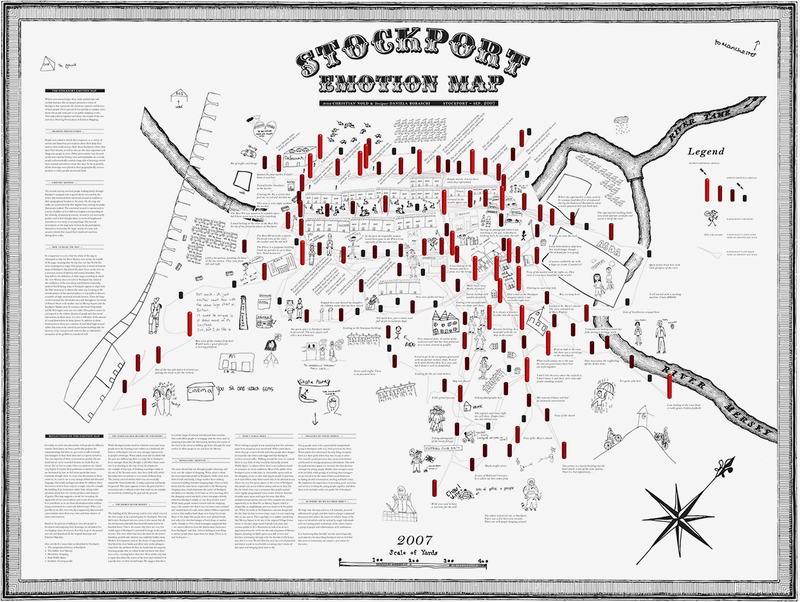 In the Stockport Emotion Map, produced in 2007 with approximately 200 people involved in re-mapping their local area, Nold provides a contrast to the static architecture excluding humans of conventional maps. He instead aims to ‘present a picture of Stockport that represents the emotions, opinions, and desires of local people’,31 using sensor data collected during the public Emotion Mapping process (measuring emotional arousal) with Drawing Provocations (participants’ descriptions and drawings of significance held by these mapping locations). The result is a more diversified representation of the subjective experience of the terrain explored and the data-capture of arousal indicators. One interest find is the lack of coincidence between heightened arousal levels and subjective recollections of ‘remarkable’ places, indicating a split between how participants subjectively absorbed the experience and how their bodies actually reacted to the terrain. This clearly indicates the space between conscious experience and affect at the heart of the discussion of Affect Space. 1. Practical engagement: As stated previously, this new techno-sensuous spatial order is not a speculative matter – it is already in full operation. It is neither accidental nor an unintended by-product of technological development. The mobilization and scrutiny of ‘feelings’ (affect and emotion) in the intensified densities of contemporary hybrid spaces serves a variety of strategic agendas (economic and political involving surveillance and control structures and strategic forms of disruption). While this emergent order is rife for manipulation, due to its nonlinear dynamics no single actor is in full control of its outcomes. Understanding these dynamics can help to develop more responsible design approaches to the key elements that drive them. The prospect of all-inclusive control structures invading our most subjective experiences, through consumerist and political manipulation, is obviously undesirable. Such forms of advanced affective policing and persuasion compromise both our ‘mental ecology’ and the public sphere. 2. Political engagement: The so-called ‘movement(s) of the squares’ has demonstrated the connective force of affect-driven forms of mobilization and activation of public spaces. Yet despite success virtually all of these ‘movements’ have been hampered by a dramatic lack of political efficacy. This conundrum presents itself as a paradox – how to account for the simultaneous success in mobilization and lack of any substantive progressive political outcomes. One reason is the semantic openness of affect. I have argued already that the connective force of these affect-driven formations relies primarily on the degree of affective resonance produced by the ‘affective attractors’ deployed by these ‘movements’. And furthermore that the most semantically void resonance objects create the strongest affective resonance. But this absence of a semantic structure with designated concepts (demands, issues, things) is deeply problematic when creating new and effective political formations. The moment a connection is established with an articulated political issue / thing, the connective tissue of the shared affective resonance breaks apart. The primarily affect-driven social formation then dissolves. This principle has rendered these ‘movements’ deeply ineffective when confronted with adversarial strategic political actors. The success of affect-driven forms of mobilization becomes a trap for activists staging the ‘choreography’ of protest, a liability rather than a possibility. It turns out when affective resonance is used tactically (through invention and deployment of forceful affective attractors), it becomes very difficult to bend it to a strategic purpose. The other reason is less obvious, but perhaps more crucial in order to resolve the paradox of success in mobilization and lack of political efficacy. We have witnessed not so much the ‘mobilization of a crowd’, but modes of ‘activation of public space’. The ‘crowd’ is a by-product of public space when it is reconfigured under conditions of intense densification of hybrid space. Affect in this process holds more primacy over any deliberation, above the affective threshold. The process of activation is essentially blind – it accommodates virtually every issue or ‘matter of concern’ (Latour), and connects normally separate or even opposite issues. The path of affect-driven forms of activation / mobilization is seductive, given their surprising short-term success in bringing together previously unrelated actors. However, continuing along it runs the risk of simply creating further instances of ‘political’ formation ineffective by design. Instead, it seems necessary to develop forms of political mobilization and organization that avoid, bypass, or transcend modes of affective activation of densely hybridized public spaces. In effect what is required are public modes of engagement that foreground deliberation over affect. I would describe this act as engaging in deliberative forms of political design. 3. Experiential engagement: Art can play an enormously powerful role in experientially revealing the (hidden) play of / on affective registers employed by a variety of strategic actors, which mostly remains implicit within the structure of Affect Space. The classic urban driftwork procedure established by Guy Debord in his ‘Theory of the Dérive’,33 already served to reveal how the built environment influences its inhabitants on a non-conscious affective level. Location-aware mobile media pushed this work much further. Emotion and biomapping procedures developed by Nold mentioned above are good examples of artistic practices that reveal the implicit affective pre-ordering of the environment. The recent work on sound cartography by Esther Polak and Ivar van Bekkum is another example that contrasts the articulated descriptions of a terrain, in this case using Google Earth cartographic images, with the subtle inflections and resonances of the captured environmental soundscapes but there are many other approaches that can intensify this process.34 By breaking open the black box of the vast array of tracking and persuasion technologies that accompany our everyday movements, artistic experiments can help to reveal, experientially, for a non-expert audience, the presence and role of these non-human agencies in everyday life, whose operations normally remain covert. 1. This naming used by a variety of commentators, activists and researchers refers broadly to the self-similar occupations of public urban spaces that started in 2011 with the iconic occupations of Tahrir Square in Cairo and Puerta del Sol in Madrid. Despite its manifold interlinkages it remains a question whether these gatherings can be rightfully interpreted as ‘movement(s)’ or rather a different type of formation with different(ial) functional and political characteristics. One of the aims of the T / A / S public research trajectory is to answer this question. 2. The massive mobilization for the Project X Party in Haren, the Netherlands, September 2012 referenced in the introduction to the T / A / S essay series is perhaps the most telling case in point, where any kind of socio-economic or political issue at stake was entirely absent, yet the pattern exactly replicates that of the iconic public space occupations of the ‘movement(s) of the squares’, onlineopen.org. See also ‘Facebook Party Invite Sparks Riot in Haren, Netherlands’, BBC, 22 September 2012, bbc.co.uk. 3. See Bruno Latour, ‘From Realpolitik to Dingpolitik or How to Make Things Public’, in Making Things Public, ed. Bruno Latour and Peter Weibel (Karlsuhe / New York: ZKM Center for Art and Media / MIT Press, 2005). 4. Both hardware and software, interfaces and apps of the most widely used and popular mobile media, wearables and cross-platform apps are deliberately designed as addictive objects – perpetuating the incessant drive for continuous and repetitive intoxication ‘by design’ (excessive e-mail / timeline checking, messaging, somatic metrication). This includes haptic feedback mechanisms impinging on our bodies most intimate regions. 5. See Félix Guattari, The Three Ecologies (London: Athlone Press, 2000 ). 6. In response to my essay ‘Affect Space: Witnessing the “Movement(s) of the Squares”’, onlineopen.org, Vogelaar and Sikiaridi provide a more precise genealogy of how they developed the concept of Hybrid Space from 1988 onwards, hybridspacelab.net. 7. Frans Vogelaar and Elizabeth Sikiaridi, ‘idensifyingTM translocalities’, in Logbook NRW.NL (catalogue) (Amsterdam: De Balie, 1999) citing Vilém Flusser, ‘The City as Wave-Trough in the Image-Flood’ (1988), trans. Phil Gochenour, Critical Inquiry 31 (winter 2005): 320–328. 8. Adrian Mackenzie, Wirelessness: Radical Empiricism in Network Cultures (Cambridge, Massachusetts: MIT Press, 2010), 213. 9. See Lilie Chouliaraki, Self-Mediation: New Media, Citizenship and Civil Selves (New York: Routledge, 2012). 10. See Kluitenberg, ‘Affect Space’, onlineopen.org. 11. Brian Massumi, The Autonomy of Affect, in: Parables for the Virtual: Movement, Affect, Sensation (Durham, NC: Duke University Press, 2002), 35. 13. Jean Baudrillard, ‘The Precession of Simulacra’, in Simulations (New York: Semiotext(e), 1983), 81. 14. See Roland Barthes, Camera Lucida – Reflections on Photography (New York: Hill and Wang, 1982). 15. Massumi, The Autonomy of Affect, 24. 17. 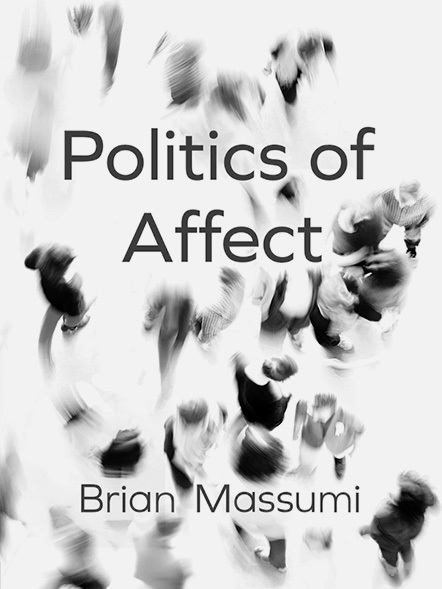 See Brian Massumi, The Politics of Affect (Cambridge, UK: Polity Press, 2015). 18. Massumi in conversation with WTF Affect, WTF Affect, 18 August 2016, wtfaffect.com. 19. Massumi, The Autonomy of Affect, 29. 20. The point here is that affect is always before cognition, but it is also ‘beyond’ – by the time cognitive processing has taken place, a felt intensity has already escaped and moved elsewhere. 21. Massumi, The Autonomy of Affect, 29. 22. See Lance Bennett and Alexandra Segerberg, The Logic of Connective Action, Information, Communication & Society 15, no. 5 (2012): 739–768. 23. See Latour, ‘From Realpolitik to Dingpolitik or How to Make Things Public’ and Noortje Marres, ‘No issue, no public: democratic deficits after the displacement of politics’, PhD dissertation, University of Amsterdam, 2005, academia.edu. 26. Massumi, The Autonomy of Affect, 24. 27. Massumi, The Politics of Affect, 109–110. 28. See Paul Virilio, The Vision Machine (Bloomington: Indiana University Press, 1988). 29. Paul Moore, ‘Securing the Cities of the Future’, Ascent Magazine, 25 January 2015, ascent.atos.net. 32. Simona Levy, ‘24M: It Was Not a Victory for Podemos, but for the 15M Movement’, Open Democracy, 9 June 2015, opendemocracy.net, for instance, gives a good impression of the diversity of experimentation with ‘political designs’ in the larger metropolitan area of Barcelona. 33. See Guy Debord, ‘Théorie de la dérive’, Internationale Situationniste, no. 2 (December 1958). 34. See, for instance, PolakvanBekkum, 250 Miles Crossing Philadelphia (2015), 250miles.net. 35. See Bruno Latour, The Politics of Nature (Cambridge, Massachusetts: Harvard University Press, 2004). Technology / Affect / Space (T / A / S) is a conceptual and interdisciplinary research project into the interaction between technology, affect and public space initiated by Open! together with media theorist Eric Kluitenberg. It can be considered as a continuation and actualization of the Hybrid Space issue of the Open! print cahier in 2006 on the mobilization of public space facilitated – and even initiated – by wireless media. In Hybrid Space we noted that publicness has become ‘a complex of concrete and virtual qualities, of static and mobile domains, of public and private spheres, of global and local interests’ and asked how a critical position could be possible in a hybrid space that is characterized by invisible information technology. Since then Web 2.0 and wireless media have only developed further; social networks such as Facebook and Twitter came into being and mobile media devices are now ubiquitous. T / A / S takes into account the ultimate implications of this for the public sphere in exploring the dynamics, aesthetics, design and politics of an emergent techno-sensuous spatial order that we refer to as ‘Affect Space’. There have been three exploratory public events so far on this topic in 2016: Amsterdam (with De Balie and LAPS); Rotterdam (with the New Institute); and Boston (with ACT, the MIT Program in art, culture and technology). A series of articles will be released on Open! in the coming months. What follows is a brief introduction to the underlying subject matter and key questions of T / A / S.
The emergent techno-sensuous spatial order of Affect Space is characterized by three constitutive elements: the massive presence of self-produced media forms, the context of (occupied) urban public spaces and the deep permeation of affective intensity in these media forms and urban spaces. While not ‘invented’ by anyone, the complex dynamics of the interaction among these three elements became clearly visible in the extraordinary series of popular protest gatherings in public space that have dominated world news from early 2011 onwards. In each case the local context and ‘underlying issues’ were remarkably diverse (Tunis, Caïro, Madrid, Barcelona, Athens, New York, São Paulo, Haren, Kiev, Hong Kong, Ferguson, Paris...), the pattern of simultaneous mobilization in the media and physical space was incredibly consistent – as was the ephemeral dissolution of these same acts. This striking pattern of sudden collective mobilization and dissolution in public space is not limited to these protest gatherings, and cannot be explained exclusively by the aide of technology in their coming into being. Nor can it be reduced to the contested political, ideological and economic issues at stake. The diversity of context, incitement and participants is simply too great to hold accountable for the recurrence of this pattern. The above point is perhaps illustrated tellingly in an early example of this pattern, with the ‘Project X’ party riot in the suburban town of Haren, the Netherlands in mid-2012.1 A Facebook invite to a local girl’s sixteenth birthday party (accidentally posted ‘public’) was picked up and transformed into a Project X party meme. It went viral, generating enormous traffic and (mass media) attention. In reaction to the seemingly immanent public order disturbance local authorities organized a massive police response. On the designated date numerous police officers and a large crowd of Project X Haren participants clashed over a party that never existed, leading to the devastation of the city centre’s public space and widespread damage to private properties. A national investigation produced a thorough report.2 Most intriguing was the media analysis by researchers at Utrecht University. They concluded that the crowd build-up was incited almost exclusively via social media channels. Mass media exposure had a negligible influence. While the mobilization pattern was virtually identical to the large protest gatherings we’ve become familiar with since 2011, any kind of underlying contested social or political issue was completely absent. So how do we account for these remarkable phenomena? A technological component: The Internet, but in particular the widespread use of mobile and wireless media perform a crucial function to mobilize large groups of people around ever-changing ‘issues at stake’. An affective component: A recurrent characteristic is the affective intensity generated and exchanged in these mobilization processes. Reasoned arguments seem to play much less of a role than affective images, suggestive slogans (‘We are the 99%!’ / ‘Je (ne) suis (pas) Charlie’) and vague but insistent associations with things that are felt as highly desirable (the mystique of a Project X party in (sleepy) Haren, whose meaning no one fully grasps, and whose existence is subject to question – in this case with no party taking place at all). A spatial component: Particularly the affective intensity generated in the mobilization process cannot be shared effectively in disembodied online interactions on the Internet and via apps. This lack stimulates the desire for physical encounter, which can only happen in a physical spatial context paradigmatically in (urban) public space. The use of mobile and wireless media changes the nature of public space dramatically. Ever- tighter feedback loops of the physical and the mediated are generated, turning streets and squares into media channels and platforms in near real-time. As wireless networks speed up, the speed of these feedback loops is only intensified (Wi-fi, 3G, 4G, et cetera). The physical and mediated feedback loop precipitates affect-related forms of communication and exchange. In these dense environments, messages, images and impulses with the strongest affective effect – not the most well thought-through argument, delicately composed visuals or eloquent exposé – are the most apt for dissemination. How does the complex but highly recognizable interaction between technology, affect and physical space influence use, design and behaviour in public space? What is the significance of this development for political processes, particularly when the relation between content and affective slogans and images becomes extremely ambiguous? Which new forms of manipulation and control emerge, in the media space and in public space – in short in the public domain? How can effects that undermine rather than support an open democratic social order be counteracted? What role do artists, designers, architects and urbanists have in these processes? And what is the role that they wish to assume? There is a rich repository of engagements with the implicit and explicit orderings of public spaces, ranging from psychogeographic procedures developed by the Situationists, to critical theories and practices in architectural and urban design, information architecture, and geo-locative arts and design, as well as within social movements, community arts, and media theory and activism. The aim of T / A / S is to bring protagonists in these different fields into conversation on the emergent techno-sensuous spatial order of Affect Space. Please continue to visit us as the essay series puts forth contributions by media scholar, artist and activist Alessandra Renzi, artist- researcher Sher Doruff, architectonic office JARD (Javier Argota and Rodrigo Delso), media theorist Nishant Shah, artist-designer Christian Nold, Eric Kluitenberg and artists PolakVanBekkum (Esther Polak and Ivan van Bekkum). Massumi notes that affect moves at approximately double the speed of conscious perception and the qualification of impressions and states of the body. Cognitive experiments have shown that conscious qualification of such bodily impressions and their “completion in an outward directed, active expression” takes on average 0.5 seconds. Massumi calls this lapse the “missing half second” (Massumi 2002, 29). Bodily responses to such impressions can, however, already be measured (for instance, in changes in galvanic skin resistance) within 0.2 to 0.3 seconds. With an average of 0.25 seconds, this implies that the affective link takes half the time to establish itself and operates at twice the speed of conscious qualification. Nigel Thrift further reinforces what Massumi has so beautifully described as the “missing half second”. Thrift points out that repeated clinical tests by cognitive psychologists and neuroscientists have revealed that the engendering of a conscious reaction to impulses from the environment can take up to 0.8 seconds and in some cases even longer. That we register our “experience of events” as seamless is simply the result of the fact that we experience them in a continuous flow. If we follow Massumi’s suggested average response times, then affective responses take 0.25 seconds to be formed, whereas conscious responses take 0.5 seconds. In short, affect moves at twice the speed of consciousness. The relationship between affect and its capture in consciousness (through an articulated feeling or emotion) is always, and necessarily so, asymmetrical. In a way, our conscious perception is playing a continuous catch-up game with our affective states, which is already lost a priori. Phrases like ‘they finally gave in to public pressure’ or ‘public opinion responded unintelligently’ are pretty standard utterances. The normalcy of such expressions may easily obscure the fact that they evoke a mysterious entity. Indeed, the conjuring up of a public that is capable of performing acts, such as ‘exerting pressure’, inevitably involves a certain amount of wizardry. But this wizardry often goes unappreciated. Those who want to support a given public will want to affirm its reality. Accordingly, they have little interest in acknowledging the magic involved in its manifestation. And those who are critical of a particular public are likely to follow the strategy of showing that this public is not a real public. They will want to demonstrate that in fact we are dealing here with little more that a few actors with dubious interests: just business people, or leftists. That is, they will try to kill the magic. But an appreciation of the wizardry involved in the emergence of publics is crucial, it seems to me, for a good appreciation of what they may be capable of. A first rough indication that publics that are capable of action represent a riddle is that, as long as we follow everyday logic, such entities appear to be a practical impossibility. The notion of a public endowed with agency brings together two contradictory demands. On the one hand, ‘action’ requires that there is an identifiable actor, and preferably an individual, that can be said to do the acting. This is clear from how we deal with questions of justice, for instance. To establish that a particular deed has been done, whether bad or good, we customarily require that there is a specific doer who can be associated with this doing. A bottom line of our everyday logics is that there is no deed without a doer. But, on the other hand, it is an important characteristic of a public that it cannot be reduced to an identifiable actor. As a rule, a public must consist of more than a known set of individuals. When it is revealed that behind a public there is merely a particular social grouping, its status as a public is challenged. When it can be said: these are only the environmentalists making a fuss, then we are only dealing with a special interest group. When it is revealed that ‘it was the political campaign team that directed the crowd into the hall, to cheer during the candidate’s speech’ we speak of a scam. A public must thus satisfy two demands simultaneously: it must be capable of agency, but it must not be reducible to an identifiable agent. How could such an impossible combination of demands nevertheless come to be accepted as normalcy in many contemporary cultures? Crucial in this respect is a particular commitment that is peculiar to advanced democracies: the commitment not to accept, as matter of course, that if a public is to act, then a representative must do the acting for the public. Indeed, one could say that radical democracies are defined by the requirement that it should be impossible to trace back a public’s actions to one (or a few) identifiable social actor(s). To sustain this demand, to perform a deepening of democracy beyond representative democracy, all sorts of formats have been developed that enable the public to express itself, and potentially, to acquire agency in the process. The mass demonstration is one solution, the opinion poll is another, and then there are the spectacular protest event and the media debate, and so on. These formats can be regarded as attempts to make the riddle of an acting public workable: to produce a capacity to act without producing an identifiable agent. That is, these formats are to enable the emergence of agency in the absence of a specifiable actor behind the action. To speak of the formats that are available for organizing the public, is also to say that media have a special role to play in all this. To begin with, the media are sometimes held responsible for bringing about the radicalization of democracy mentioned above. According to some political theories, it was an effect of the rise of print media that the public came to be understood as an audience endowed with a voice. Media must then be held responsible for a certain loss of respect for representative democracy, for instance for the idea that it is sufficient for a public to act through individual representatives. Thus, according to the philosopher Kierkegaard, ‘the Press’ was to blame for the fact that the public in his time had become an abstract entity. He observed that in ancient times, ‘men of excellence’ could stand in for the public, but after the rise of print media, the public had taken on the form of ‘a monstrous abstraction, an all-encompassing something that is nothing, a mirage – and this phantom is the public.’ Intriguingly, one of Kierkegaard’s main problems with this media-based phantom public was that it was incapable of action. However, a few decades after Kierkegaard made his gloomy observations, the American public intellectual Walter Lippmann developed the argument that media provide crucial instruments for the evocation of phantom publics, including phantom publics with a capacity to act. According to Lippmann, writing in the 1920s, media like the daily press, the radio and the telephone are indispensable for the organization of publics, that is, for the production of a non-actor that can nevertheless act in certain ways. For him, publicity media make it possible to produce the public as an effect. As they report conflicts, provide forums for debate, and poll audiences, Lippmann argued, media enable the expression of publics. In these ways, namely, media give direction to the indefinite and multiple concerns of an open-ended population. They channel these concerns into a current with a definite charge, that of being for or against a given position, decision, intervention. By redefining the public as an effect of media circulation, Lippmann went some way towards solving the riddle of the public. The trouble with his solution, however, is that by reducing the public to an effect he made the public look quite weak. For Lippmann, to make a public emerge is to extract a definitive ‘no’ or ‘yes’ out of content and sentiment circulating in media. It is hard to see what could make a public that obeys this description strong enough to be able to exert force. That is can exert such force, however, is clear from phrases like ‘they were obliged to respond to public pressure’. Thus, the question that remains open after Lippmann is that of the forces that publics may unleash. To appreciate this force, I would say that we should at the least recognize the following: the agency of the public derives in part from the fact that this entity is not fully traceable. That is, the force of the public has to do with the impossibility of knowing its exact potential. And this for the following reason: when a thing is publicized in the media, whether a person, an object or an event, this involves the radical multiplication of the potential relations that this entity can enter into with other things and people. Thus, when something starts circulating in public media, this brings along the possibility, and indeed the threat, of an open-ended set of actors stepping in to support this entity, and to make it strong. The fact that the public cannot be definitively traced back to a limited number of identifiable sources is thus crucial to the effectiveness of the public: this is what endows publics with a dangerous kind of agency. This also makes it clear why the wish to concretize the public, to boil it down to the real actors that constitute it, involves a misunderstanding of the public. In relating to publics, and in performing ‘the public’, the point should be to try and work with the threat of a partly untraceable potential of connections, and not to dissipate it.